Here’s what it means: The spike in EV sales in Q1 is likely a function of the Chinese government’s bolstering of growth in the country’s electric car market. At the same time, last year China’s National Development and Reform Commission announced a $47 billion fund last year that’s designed to support EV technologies such as batteries and drivetrains. 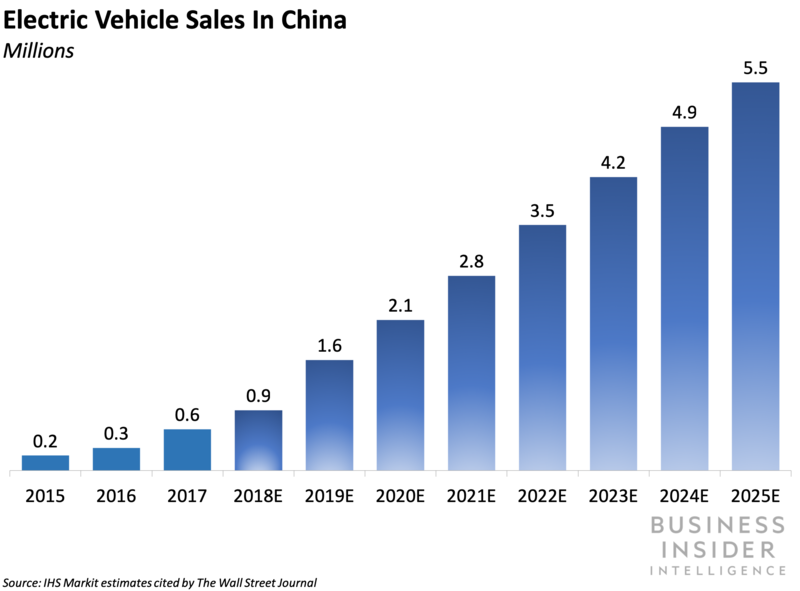 As the government encourages the production of EVs, it will continue to drive adoption higher: Annual EV sales in China are poised to expand to reach nearly 5.5 million units in 2025, according to IHS Markit estimates cited by The Wall Street Journal. The bigger picture: The EV sales spike and highly promising longer-term market should prompt foreign automakers to accelerate their investment in EV production and assembly in China. Consulting firm Alix Partners projects that global automakers will spend $255 billion on EV research and development through 2023, massive costs they’ll want to recoup in the form of profits sooner rather than later. China will need to be a part of that strategy, especially for US automakers: While 254,000 EVs were sold in China last quarter, less than 50,000 were sold in the US over the same period.